What Keeps us Living and Thriving? As often happens, the channeled words of Abraham/Hicks inspired my newest Symbala. Feel the Life! The ‘Act of Flowing’ is rooted in the creative force embedded in the number ‘3’ used in its structural geometry. For the complete text about this Symbala, click on the picture. Don’t forget to visit my Zazzle Store where you will find ‘Act of Flowing”vitalizing many products like a greeting card, poster, magnet and keychains. Posted by Lahrinda in Symbala Stuff,What's New,Zazzle Stuff	Comments Off on What Keeps us Living and Thriving? I was curious about this new Symbala. When it was finished, I sat with it and realized that I felt comforted. Feeling comforted is a very good feeling. It calls to your inner child who feels loved and appreciated. It’s especially wonderful in times of sadness or grief. However, I wasn’t feeling particularly sad when I drew it. Yesterday, a dear friend called to let me know that another close friend of mine had passed a few days ago. I felt blindsided and disbelieving that Sunny Bunnell had translated! She went in for an operation and didn’t make it past the anesthesia. She was the sweetest, most loving spirit and STILL IS. Even now I hear her laugh and see her twinkling eyes. She is a blond angel. I suddenly realized why the ‘Comforting’ Symbala had come through. It came for me and everyone else who feels comforted by its softness and the presence of the loving spirits surrounding it in a completion ring of ‘9’. Rejoice and be comforted; we are eternal, divine sparks connected in love. Don’t forget to visit my Zazzle Store where you will find ‘Comforting” gracing many products like a greeting card, poster, magnet and a gift box. First let me say, in my experience, that each Symbala has been an amazing snapshot in time for the thoughts and energies I was going through. 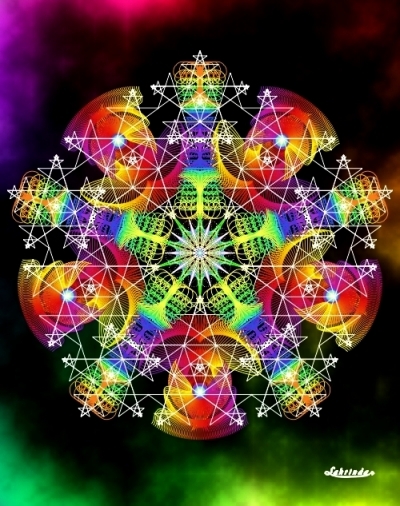 I met Lahrinda near the beginning of my energetic journey and over the years with each Symbala Renewal I would be drawn into the shapes, color, energy and reflect on what was being shown to me. My first Symbala had a Sun-like structure in the center with plumes going off in different directions and a strong Mercury influence (2003). The following year the center had cooled with the surrounding designs in warm colors with a deep multi-layered structure and sense of harmony. Four months later a Symbala appeared with a beautiful flower like design in the center laying on a small green field with soft Sun energy springing up around the green field. The Mercury energy came back stronger with more clarity and a feeling of purpose. I am amazed at how different each Symbala has been and what they have shown me. This latest Symbala is by far the most complex with a message just as important as those in the past. There is so much intricate detail that I have used a magnifying class to get a closer look at some of the designs and found energies I, at first, didn’t consciously realize were there. Unfortunately, the web blurs the Symbala and does not reflect the true definition and design that was created. 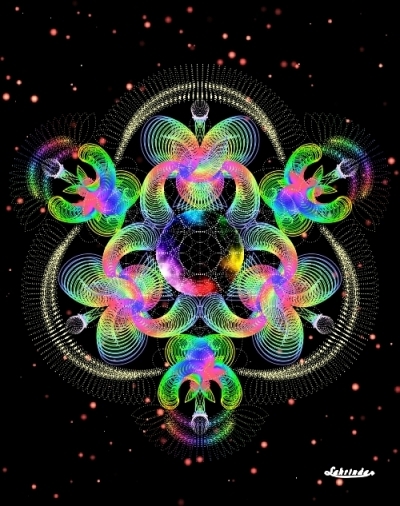 The center design is easy to focus on and follow into it’s celestial depths while at the same time there are universal, cosmic and other energies. Mercury once again shows up, this time with a warmer more heartfelt energy. Thank-you, Lahrinda, for a wonderful Symbala! Featured Symbala of the Month, April 2018. Yesterday the sun was shining over our little Beverly Lake, a gentle wind blowing and the temperature got up to 70 degrees, a very big deal in the Puget Sound area this time of year. Everyone was dressed and yearning for Spring! I knew from the forecast that it wouldn’t last, but when I woke up this morning to the return of the gray with rain eminent, I knew it was time to release some alternate vitality. Whether it is crazy-making news or crazy weather, there are lots of reasons to have a balanced core stability from which to perceive the world we’re creating. 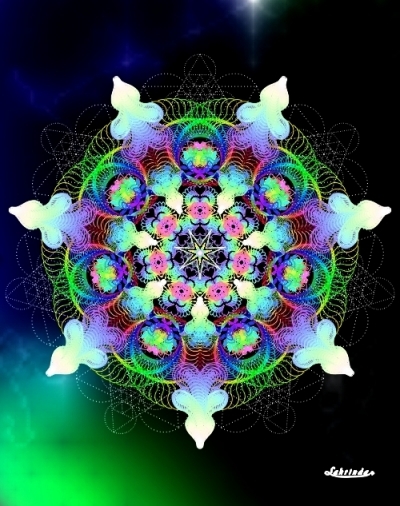 I have devoted my Symbala art to the maintenance and expansion of that very core of our being. 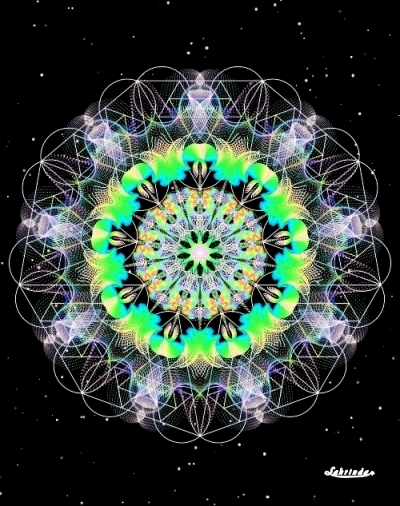 Symbalas are a way to remind ourselves of the soothing, yet inspirational qualities of beauty and symmetry with a visceral connection to the empowering qualities of Sacred Geometry. Visit my Zazzle Store where you will find ‘Invigorate’ empowering many products like a greeting card, poster, magnet and a medallion you can wear.